It’s no yolk! We’ve got 4 fabulous Easter Escalators running this weekend - a chance for you to win a share of over £100k! 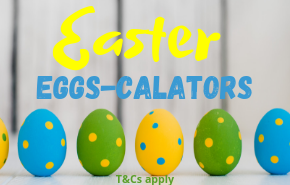 Join us for your chance to win in our Easter Eggs-calators. We’ve got 4 escalators over the Easter Weekend! Play in the featured Bingo rooms, see table below. Call Full House on any game before the stated ball count and win 50% of the Escalator Jackpot. The ball count rises every hour and the jackpot is guaranteed to drop on or before midnight. What’s more, the remaining 50% of each Community Escalator Jackpot will be shared between everyone with a ticket for the winning game - the more tickets you hold, the larger the share you will get! See featured rooms, daily jackpot amounts and ball counts. This is a network promotion open to all members of participating Virtue Fusion websites. A Community Escalator Jackpot will run each day from 4pm in one of the above rooms . The ball count will rise by two balls every hour. The Community Escalator Jackpot is guaranteed to be won before midnight on the same day. Please see the table above for more information. 50% of the Community Escalator Jackpot prize will be won by the player/s that call a Full House in the stated ball count or fewer. The other 50% will be shared between all players with tickets for the winning game. Your share is dependent on the number of active tickets you have in the game. Community Escalator Jackpot prizes will be automatically credited to your withdrawable cash balance. Once the Community Escalator Jackpot has been won, the Jackpot and ball count will reset to their default amounts.